The West still does not want to recognize that a coup in Ukraine was organized with the support of the United States and the European Union, Russian Foreign Minister Sergei Lavrov said. "Speaking about our Western partners, everything has gone if not out of control, then at least by a very confrontational scenario. The reason is simple: they do not want to admit what is obvious to us - that the coup [in Ukraine] was organized with the direct support, if not encouragement, of the United States and Brussels," Lavrov said in an interview with the TVC channel. "After these people, who had been actively supported, came to power and formed a new government, everything became possible for them," the Russian foreign minister said. "They are forgiven [everything] and are allowed [to do] whatever they wish. We hear nobody criticizing their unacceptable statements in regards to nationalism, Russia, minorities and neo-Nazi tendencies," Lavrov said. The Russian foreign minister said that he had not heard "any judgments that could mean that the positions of the West are unanimous" from his colleagues from Africa, Asia and Latin America. Moscow is aware that not only "the US, but also the European envoys travel to every capital around the world, with no exception, to demand from the leaders of states, to strongly request not to support Russia, to join the Western sanctions and to refrain from any steps that will further the ties between a particular country and the Russian Federation," Lavrov said. "For me this is an unprecedented situation. Such campaigns are, in fact, subversive for Russia's relations with its partners." Lavrov noted that Russia’s proposal to turn the commitments given within the framework of the Organization for Security and Co-operation in Europe (OSCE) and the NATO-Russia Council (NRC) not to strengthen the security of the alliance “at the expense of the security of others" into a legally binding agreement “was rejected multiple times”. "We are convinced that the choice fixed in Ukrainian legislation is in the interests of the Ukrainian people and the legitimate interests of all the neighbors and partners of Ukraine, and the interests of European security" Lavrov said in the TV program Pravo Znat of the Moscow-based TV Tsentr channel. The Russian Foreign Minister also claimed that the non-aligned status of Ukraine is a matter of principle for Russia. He added "there are numerous assurances coming from Western partners that they understand the value of Ukraine's nonaligned status for security of the Euro-Atlantic region," the minister concluded. The government of Ukraine has approved a draft law to abolish the nonaligned status of the country, a significant step towards joining NATO. Ukrainian Prime Minister Arseny Yatsenyuk said that Kiev's goal was to "obtain a special status between Ukraine and NATO." Ukrainian Prime Minister Arseniy Yatsenyuk's surprise move to scrap the nation's non-aligned status at the time when Kiev and Moscow are coordinating their Minsk agreements is presumably meant as a direct challenge for President Petro Poroshenko, the Russian foreign minister said Saturday. "Prime Minister Yatsenyuk… came up with an initiative to introduce a draft document scrapping [Ukraine's] non-aligned status and taking the course toward NATO [membership] precisely during the coordination of the Minsk accords. I cannot but see these actions as a direct affront to the country's president," Sergei Lavrov said in the Pravo Znat (Right to Know) show on the TVC channel. Lavrov said that Yatsenyuk and "some other politicians" who had earlier suggested this step had been acting "not in the interests of their own people but in [the interests] of those seeking to cause a split between the Ukrainian and Russian peoples and drive a huge wedge between Russia and Europe." He claimed the initiative came from "first of all Washington." The United States does not even try to conceal its agenda," the Russian top diplomat said. Ukraine's Parliament Speaker Oleksandr Turchynov and controversial politician Yulia Tymoshenko earlier came up with a similar move to renounce the turbulent nation's nonaligned status. Ukraine passed laws confirming its nonaligned status and dropped its NATO membership bid in 2010. Kiev sought NATO membership under President Viktor Yushchenko but his successor elected in February of 2010, Viktor Yanukovych, stressed the country did not seek alignment with any military bloc, but needed to maintain good strategic relations both with NATO and Russia. Washington is pushing Ukraine towards the precipice for the sake of its own agenda of weakening Russia and the steps it had been taking with regard to the Ukrainian crisis have already proved it is willing to grant "carte blanche" to extremists, rather than work to achieve peace in the country, Russian Foreign Minister Sergei Lavrov said Saturday. “Almost everything that radicals and extremists in Ukraine do, including those in the government structures, gets ‘carte blanche’ from the United States; none of the arguments are working that point to the necessity of taking an objective look at what is happening and calling for national dialogue, reconciliation and respect for minority rights – all the values that the West promotes in any other conflict,” Lavrov told the Russian TVC channel. According to Lavov, “Washington has repeatedly proved that its goal is to escalate this crisis to the maximum in order to use Ukraine as a bargaining chip in yet another attempt to isolate and weaken Russia”. Although the Unites States are trying to do their best to disrupt the economic relations between the EU and Russia, Russia is not losing the battle for influence in Europe, Foreign Minister Sergei Lavrov said on Saturday. 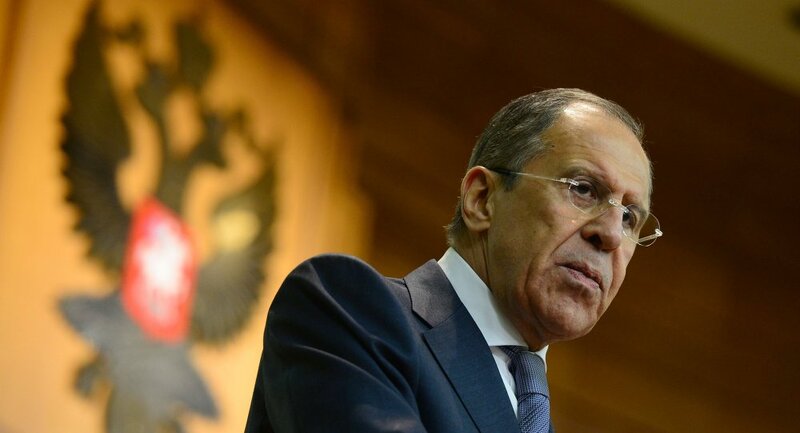 "There is a big battle going on," Russian Foreign Minister Sergei Lavrov said in an interview with Russian TVC channel. "The United States want to use the current situation in order to separate Europe from Russia economy-wise and bargain the most favorable conditions for themselves in the context of the ongoing negotiations on the creation of a transatlantic trade and investment partnership." The Russian foreign minister said that such talks have been going for several years. "Europe has been persistent enough in defending its interests. According to the Europeans, the United States wanted to gain unfair profit. Now, however, these [US] efforts have intensified, including through the attempt to force Europe to purchase the American liquefied natural gas at prices that cannot be competitive with the price of the Russian gas. This was definitely motivated by economic interest. Still, geopolitical calculations play a huge role, a key one," the minister said. Answering the question on whether Russia is losing Europe to the United States, the Russian Foreign Minister said, "I think not." "Now we are seeing the EU giving the subject a second thought. The fact that some of the EU countries, which are not the largest and do not have a leading role, begin to argue openly that the policy of sanctions is a deadlock, that it is counterproductive, says a lot," Lavrov said. Lavrov said that the EU sanctions "cannot last long, because within the EU there already are sensible voices who drew attention to the absolutely paradoxical situation, when right on the day of the signing of the peace agreement in Minsk [on September 5], the EU has decided to entrust Committee of Permanent Representatives in Brussels with preparing a new set of sanctions." "It was exactly on the day when we had a breakthrough in peace talks, primarily due to Russian President Vladimir Putin's initiative," the head of the Russian Foreign Ministry said. Russia hopes that the alienation between the European Union and Russia will not become strategic and is interested in strengthening bilateral cooperation, Sergei Lavrov said. "I'm sure it will pass. We already begin hearing sensible voices in the EU. By no means do we believe that this alienation will become strategic," he said. The Russian foreign minister said that the Western colleagues, including from the EU, are still calling, coming to visit and are inviting Russian representatives for talks. Some planned meetings have been postponed but when such delays in meetings are publicly announced “they [the Western partners] immediately confirm their interest in the continuation of dialogue … only at a later date," Russian Foreign Minister said. Lavrov said that Russia is interested in a strategic partnership with the EU to grow in strength and develop. "If you add up the potential of Russia and the European Union, then both will benefit from stronger positions in the world markets," the Russian foreign minister said. Russia is still prepared to take practical steps for the implementation of this course, the minister added. The idea of creating a free trade zone between the EU and the Customs Union by 2020, and in future the Eurasian Economic Union, is still relevant. "This idea is still alive, relevant and is of particular interest [to Russia], especially in the context of the current events in the economic relations between Ukraine and the EU, and Ukraine and the Commonwealth of Independent States. That would be the answer to a lot of questions," Lavrov said. The United States, as well as the European Union on Friday ratcheted up sanctions on Russia over its alleged involvement in the Ukrainian crisis – the claim that Moscow has repeatedly denied. Russian President Vladimir Putin said Russia's authorities will introduce measures in response to new Western sanctions only to protect the country's interests.